I believe the reason why men wearing tights or any type of legwear, is so… few… Is because it’s not out there as much. And I’m not just talking about the advertising for a brand name of a product. I’m talking about the advertising we all pick up on subliminally… like seeing an add for tic-tacks as an example. You may see the focus of the add being the product, but somewhere subconsciously we’re looking at what the actor / models in that add are wearing, or doing in that add… A man in a advertisement about chewing gum could be sitting in a coffee shop talking about this amazing product freshening his breath, and lifting the coffee stains from his teeth, so that’s why he chews after every cup! The gum was the focus of that add, but suddenly you want coffee… what was the man wearing, it could have reminded you to get you’re suit from the cleaners… or if he was sitting with lady friend, you may have been paying more attention to her shoes! For years the marketing world has shaped us all into this idea of how we’re suppose to dress, or act. This is why I believe more men don’t wear or have never worn tights. It’s always been seen as a woman’s garment, and not a man’s… well, not always.. there was a time when men did wear tights on a regular bases, as apart of there everyday outfits. That’s all history now, but history seems to repeat it self in some way or another… more and more men are starting to catch on to legwear once again, and discovering just how comfortable they are… hahaha… that’s another thing, did you know most women who wear tights actually hate wearing them… they only do because they have to for a job, uniform, or because they’re wanting to impress us men… while all men who wear them, hardly ever want to wear anything else, yet feel like they’re not suppose to! You see from the image I’ve put together, different outfits women wear, I’ve recreated for men. To show there is a woman’s way, and there is a man’s way of wearing the same thing. It’s not cross-dressing, it’s universal fashion for both men and women. If more of as saw outfits like this marketed for men as often as we so for women… I’m sure the world of legwear would spread, and it would seem more usual than unusual in view of the public. Here’s challenge… find a tasteful image of a woman in tights with whatever style or outfit you’d like to see done in a guy version, and I will do my best to recreate that outfit for us men. it’s not to say “Anything you can do, we can do better”, because women are with a doubt, going to look better in anything! This is just to show different style, or outfits that men and women can both pull off with the right approach. 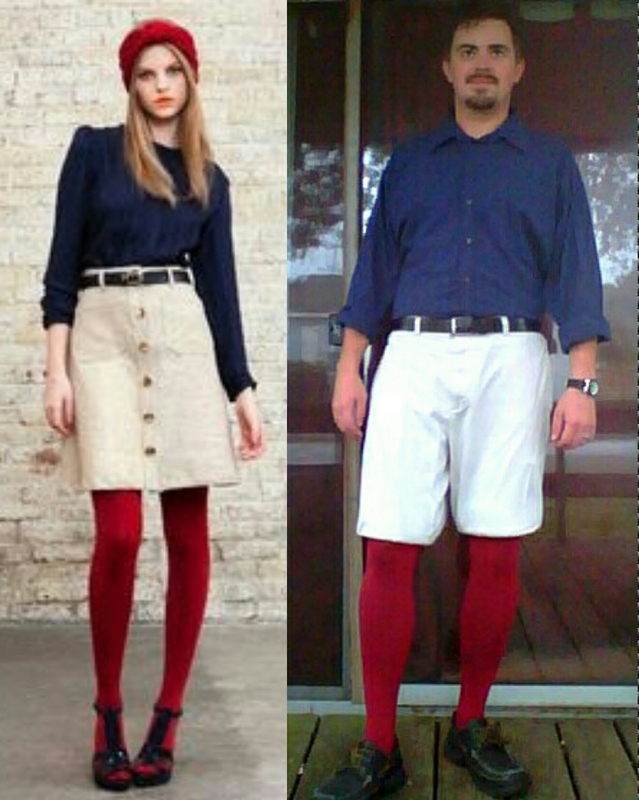 Khaki skirt to khaki shorts, blue shirt to blue shirt, red tights to red tights..
Major difference being she’s wearing the female version of the outfit, I’m wearing the males. To post an image you’d like to see recreated, please comment below, or click the contact tab at the top of the page and send me an email. 1. Outfit MUST contain tights / pantyhose. id like to see you take this to its ultimate conclusion. You rightly state that men used to wear tights as normal, but they also wore skirts and dresses (tunics, etc. a rose by any other name). So ditch the shorts and get into a skirt………….its sooooo much more comfortable………..and women DO hate wearing tights…….I wonder why? they are so comfy arent they? I wear lycra leggings all day in my taxi and have had only one comment ever, although a couple of guys have looked twice……..wierd feeling, haha, and when Im going to art events I normally wear a skirt…………nobody says anything (except my wife). Power to you dude !!! Thank Steve, I have worn a skit a few times before… along with the rest of the ladies wardrobe. It was for “opposite gender day” in highschool, during “spirit week” . I even wrote a poem about it as one of my English Journal entries. Though I did enjoy the skit most out of the rest of garments… the air flow was nice, but I still prefer shorts. You rock it though, everyone should wear whatever their comfortable in.